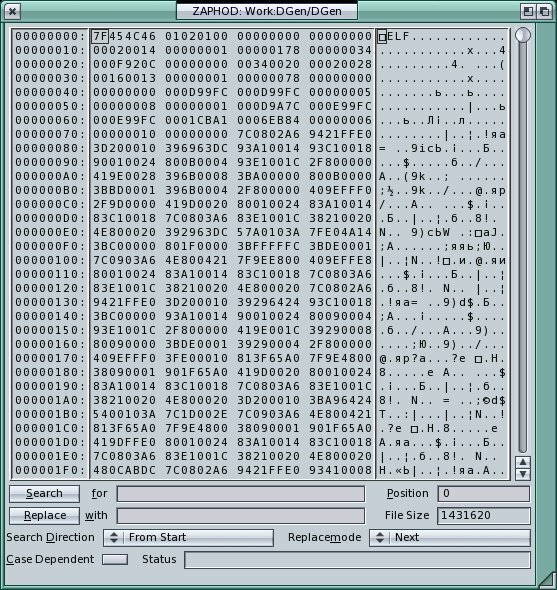 Zaphod is a file editor for binary files in the tradition of classic programs like "FileZap" and "NewZap". This file editor lets you edit several files at a time. The files you want to edit can be marked with the mouse button while holding the 'shift' key right at the start from Workbench, chosen from the ASL file requester, chosen by dropping their icons into the window or, if you started Zaphod from shell, by specifying the files as parameters after the program name. The program window of Zaphod opens on the Workbench, on a given public screen or on its own public screen which will then be named ZAPHOD.1 (or ZAPHOD.x, if you started Zaphod x times with its own screen). If you started Zaphod on a public screen, you can drop icons into it by simply drop- ping them on the application icon, which has the name ZAPPICON.1 or ZAPPICON.x. You can get Zaphod's public screen into the foreground by double-clicking on its application icon. The whole settings of the program can be given and were saved in the Tool-Types in the program icon. If you start it from shell, give the settings as program parameters. At the time there is no support for an extra configuration file, so if you want to start it from shell regularly, make an alias in 's:user-startup' of the form 'alias zaphod zaphod '.